The State Fair Gopher 'Fairchild' greets fairgoers. The Minnesota State Fair is the state fair of the U.S. state of Minnesota. Its slogan is "The Great Minnesota Get-Together." It is the largest state fair in the United States by average daily attendance. It is also the second-largest state fair in the United States by total attendance, trailing only the State Fair of Texas, which generally runs twice as long as the Minnesota State Fair. The state fairgrounds, adjoining the Saint Paul campus of the University of Minnesota, are in Falcon Heights, Minnesota, midway between the state's capital city of St. Paul and its largest city, Minneapolis, near the Como Park and Saint Anthony Park neighborhoods of Saint Paul. Residents of the state and region come to the fair to be entertained, exhibit their best livestock, show off their abilities in a variety of fields including art and cooking, learn about new products and services, and eat many different types of food—often on a stick. The fair runs for twelve days from late August into early September, ending on Labor Day. The Minnesota State Fair was named the best state fair in the United States in 2015 by readers of USA Today. The Minnesota State Fair is one of the most popular tourist attractions in the area. Around two million people attend the Fair annually. Attendance in 2018 was a record 2,046,533 people. The highest daily attendance in the history of the fair was 270,426 visitors on Saturday, September 1, 2018. Minnesota Territory first held a Territorial Fair in 1854, although the first Minnesota State Fair didn't occur until 1859, the year after statehood. Since then, the fair has run annually except for five different years. In 1861 and 1862, the fair was not held because of the Civil War and the Dakota War of 1862. Scheduling issues between the fair and the World's Columbian Exposition in Chicago, Illinois caused the 1893 show to be canceled. The fair again closed because of war in 1945, as fuel was in short supply. It was again closed in 1946 because of an outbreak of polio. In its early years during the 19th century, the fair was held in many different locations. Some were not far from the current site, but others were held in Greater Minnesota, including years where it was held in Rochester, Owatonna, and Winona. For a time in the 1870s, the Twin Cities of Minneapolis and St. Paul held competing fairs. Minneapolis, the younger city of the pair, eventually outdid its neighbor by staging the larger fair with the help of William S. King. In 1884, a committee was put together by the Minnesota State Agricultural Society to select a permanent site. One site that was considered was an area around Minnehaha Falls, but the final site chosen was the Ramsey County Poor Farm, the fair's current site. It was a politically neutral site, being about halfway between Minneapolis and St. Paul. The fair first opened its doors there on September 7, 1885. The site was then 210 acres (0.8 km²), but now stands at 322 acres (1.3 km²). One of the first annual events to occur is the creation of a butter sculpture. Each year, a new Princess Kay of the Milky Way is selected to promote Minnesota's dairy industry. Part of the job involves posing for several hours in a walk-in, glass-walled refrigerator as a 90-pound (41 kg) block of butter is carved into a head with her likeness. Butter makers started sculpting their products at the fair as far back as 1898, although the head-sculpting tradition didn't begin until 1964. The main entrance to the fair from Snelling Avenue heads onto a road named Dan Patch Avenue for a pacer horse who won every race he ran in from 1900 to 1909 when he was retired. One of the most significant dates in the fair's history was September 2, 1901, when then-Vice President Theodore Roosevelt was visiting and first uttered the famous phrase, "Speak softly and carry a big stick." Roosevelt became president just 12 days later after William McKinley was assassinated. In 1925, the Minnesota State Fair was the site of the Norse-American Centennial celebration. During his appearance at the Norse-American Centennial, President Calvin Coolidge gave recognition to the contributions of Scandinavian-Americans and noted Leif Erikson as the discoverer of America. In 1967, attendance was well over a million people and the record day that year was about 197,000 visitors. By 2016, attendance neared 2 million and the record day was about a quarter-million people. A large portion of the Fairgrounds are occupied by livestock barns, where various farm animals are displayed. The animals and their owners take part in livestock shows to compete for awards. Most of the shows take place in the coliseum, a large indoor arena on the fairgrounds. The Coliseum was constructed to replace the Hippodrome, which was rendered structurally unsound during its use as a Propeller Plant by the A.O. Smith Corporation during WWII and razed in 1946, and was completed for use in the 1951 fair. Open class livestock competitions are held in horses, beef cattle, dairy cattle, swine, sheep, dairy goats, llamas, poultry (chickens, ducks, geese, turkeys, pigeons) rabbits, and stock dogs. On August 31, 2007, a bull escaped from its handler charging several fairgoers before fatally injuring itself charging a fire hydrant. No people were seriously injured in the mishap. One of the primary attractions at the State Fair is the wide variety of foods to be had. [original research?] Classic fair foods such as cotton candy and hot dogs are available. Some foods reflect Minnesota's agriculture, including cheese curds, milk shakes, and corn dogs. Many foods at the fair are deep fried or come on a stick; from the classic corn dog to alligator-on-a-stick, lobster-on-a-stick, and deep fried candy bar on a stick. New to the fair in 2006 was hotdish on a stick, a variant of a classic staple of Minnesotan cuisine. In 2007, one new food was spaghetti on a stick. 2008's new foods included two types of bacon, one called "Pig Lickers", which is chocolate covered, and the other, called the "Big Fat Bacon", a quarter pound of maple glazed bacon. Another staple of the state fair is “Sweet Martha’s Cookies” a stand that serves fresh and warm chocolate chip cookies in buckets. In 2018, 27 new foods were introduced to the Minnesota State Fair including Firecracker Shrimp Stuffed Avocado, Honey Cream Soda Float, Mangonada Shaved Ice, Messy Giuseppe, Nordic Waffles, Smoked Soft Serve Ice Cream, and the UpNorth Puff Pastry. The State Fair is host to numerous shows, including concerts, comedy shows, product demonstrations, and the State Fair Talent Contest. The Grandstand is a large outdoor concert hall that also features 3 floors of interior exhibition space. It hosts the largest of the fairs concerts and until 2002 was also the site of stock car races run on a small oval track. In 2003 the facility completed the first phase of a $35 million remodeling project that removed large sections of bleachers and increased seating capacity to 17,000. Most local television and radio stations set up temporary studios at the State Fair in their permanent buildings or booths, including for example a live broadcast of Garrison Keillor's A Prairie Home Companion. As of 2013, the Grandstand hosts the Walker Art Center's Internet Cat Video Festival, in which fairgoers watch the year's most popular cat videos and memes and award the best videos with cat trophies, the most prized being the Golden Kitty. Guest appearances have included Grumpy Cat and Lil Bub, two internet stars, as well as the creator of Nyan Cat, Christopher Torres. The festival began in 2012. The fair displays an annual art exhibition that is the result of a juried competition of works of fine art. Media include watercolor, oil, and acrylic paintings, photographs, sculptures, pastels, ceramics, glass, and textiles. Entrants must be living residents of the state. In 2010, a total of 2,330 pieces were submitted, and 413 works were accepted. Jeffery Gauss won the coveted People's Choice award with his "MicroDoodle Topiary", and "Dog Park" by Arden Harrison Bushnell won the Kid's Choice award. One unusual display at the fair consists of the entrants in the Crop art competition. The artwork must be made of plant matter (seeds, stems, flowers, fruit, etc.) suitable for growing in Minnesota. For decades the display was dominated by Owatonna native Lillian Colton (1912–2007), who created seed portraits, professionally, having effectively captured scores of celebrities such as Ernest Hemingway, Barbra Streisand, Franklin D. Roosevelt, Prince, Princess Diana, and Willie Nelson in her crop art. After winning nine purple ribbons, she stopped competing, but continued displaying her work at the fair. The annual 5 km run begins on the fairgrounds, winds its way through the Saint Paul campus of the University of Minnesota and the Saint Anthony Park neighborhood, and ends back at the fairgrounds. 4-H has a significant presence at the fair, both in the 4-H Building and in the animal barns and arenas. Contests include herdsmanship, showmanship, judging teams, public presentations and county club exhibits. Livestock displays include beef and dairy cattle, dairy and market goats, poultry (chickens, ducks, geese, turkeys, and pigeons), rabbits, sheep, and swine. About half of all 4-H projects entered are animal science projects. The 4-H building was opened and dedicated in 1939 about 320,000 state fairgoers visit it every year. The non-livestock projects include photography, performing arts, crafts, food & nutrition, clothing & textiles, and many more. Adventure Park is where the more extreme thrill rides are located. This includes the Ejection Seat and other rides like it. It is located across the street from the Midway, but is not a part of it. Adventure park also shares this block with a french fry stand. The Minnesota State Fair is considered a quasi-state agency, under the direction of the Minnesota State Agricultural Society. The management of the fair is handled by the Board of managers. The state fair has not accepted any governmental funds since 1949. Revenue from the fair is reinvested into maintenance and the next year's fair. The Minnesota State Fair Foundation is an organization that works to improve and preserves historic state fair buildings. The foundation is a 501(c)3 organization, and also supports State Fair agricultural, scientific and educational programs. The foundation provided funding for the new Miracle of Birth center. The Fair employs about 80 full-time staff members for the entire year; in the summer, some 400 seasonal staff are hired. During the fair-time, around 3,000 people are additionally hired. The J.V. Bailey House, at 1263 Cosgrove Street, is one of the oldest buildings on the fairgrounds. It was built in 1911 and restoration was completed in 2006. It is connected to the greenhouses and was occupied year-round by the greenhouse superintendent until 2004. The State Fair Foundation operates out of the residence. The historic residence is open to Foundation donors and their family and friends during the fair. The fair's mascots are two anthropomorphized gophers. The choice of gopher as mascots was an homage to the University of Minnesota mascot which is also a gopher and was a historical reference to the expansion of railroads in Minnesota, towns popping up across the state like gophers. For these reasons, Minnesota is sometimes referred to as the gopher state. Fairchild, the original mascot, was suggested in a statewide contest by Gladys Anderson Brown in 1966 in honor of Henry S. Fairchild who advocated using the former Ramsey County Poor Farm as the permanent site of the fair. Dressed like an early barker on the midway with a straw hat and striped jacket, Fairchild has represented the fair since 1966. In 1986, he was joined on promotional materials by his nephew, Fairborn. The fairgrounds is heavily used for events beyond the Fair. These include many horse shows in the Coliseum & Horse Barn, the Minnesota Horse Expo and the Minnesota Beef Expo, dog shows, antique & hot-rod car shows, motorcycle shows, model railroad shows, clothing & jewellery shows, gun & weapon collectors shows, comic book conventions, flea markets & swap meets, and more. Buildings on the grounds are frequently rented for commercial events such as appliance sales, computer & electronics sales, and boat & car sales. Earlier in the summer, some of the fairground's roads are used to host an annual series of bike races during the week, called the State Fair Affair Criterium Series. The Coliseum was the home rink for many college and high school hockey teams. After 40 years and a few thousand games the facility saw its final game played in February, 2014. ^ a b Smith, Mary Lynn (September 4, 2018). "Minnesota State Fair breaks attendance record, surpasses 2 million for first time". Star Tribune. ^ "Detailed Daily Attendance". Minnesota State Fair. Retrieved 2014-09-02. ^ "Fiscal Notes, September 2003". Texas Comptroller of Public Accounts. September 2003. Retrieved 2007-07-17. ^ "Minnesota State Fair Sets 1-Day Attendance Record Saturday". ^ "Minnesota state fair 2006 press kit" (PDF) (Press release). Minnesota state fair. 2006. Retrieved 2007-08-06. ^ Marling, Karal Ann (1990). Blue Ribbon: A Social and Pictorial History of the Minnesota State Fair. Minnesota Historical Society Press. ISBN 978-0-87351-252-7. ^ "About the Fair". Minnesota State Fair. 8 May 2018. ^ Roper, Eric (September 5, 2017). "Minnesota State Fair on track to set attendance record". Minneapolis Star Tribune. Retrieved September 5, 2017. ^ Speer, Ray P. (1964). Minnesota State Fair: The History and Heritage of 100 Years. Argus Publishing Company. pp. 237, 271. ^ "Open Class Livestock". Minnesota State Fair. 2007. Retrieved 2007-07-17. ^ "Bull Escapes At Minnesota State Fair". WCCO. 2007-08-31. Archived from the original on 2007-09-29. Retrieved 2007-08-31. ^ "new tastes, their takes". twincities.com. St. Paul Pioneer Press. 2008-08-28. pp. 10E. ^ "Minnesota State Fair | Little Farm Hands". www.mnstatefair.org. Retrieved 2018-02-02. ^ Cunningham, Greta (2003-08-18). "State Fair Grandstand to get a facelift". Minnesota Public Radio. Retrieved 2006-09-30. ^ "Fine Arts". Minnesota State Fair. 2007. Retrieved 2007-07-17. ^ "Ag-Hort-Bee Rules and Premiums" (PDF). Minnesota State Fair. 2007. Archived from the original (PDF) on 2007-09-28. Retrieved 2007-07-17. ^ "A remembrance of the Seed Lady". MPR. 2007-03-22. Retrieved 2007-07-17. ^ "Crop Art". David Steinlicht. Retrieved 2007-07-17. ^ "Creative Activities - Rules and Premiums" (PDF). Minnesota State Fair. 2007. Archived from the original (PDF) on 2007-09-28. Retrieved 2007-07-17. ^ "Milk Run". Minnesota State Fair. 2007. Retrieved 2007-07-17. ^ "Minnesota State 4-H". Minnesota State 4-H. 2007. Retrieved 2007-08-28. ^ "4-H Livestock". Minnesota State Fair. 2007. Retrieved 2007-07-17. ^ Speer, Ray P. (1964). Minnesota State Fair: A History and Heritage of 100 Years. Argus Publishing Company. p. 203. ^ "The Eco Experience at the Minnesota State Fair". Minnesota Pollution Control Agency. 2007. Retrieved 2007-07-17. ^ "About the Fair". Minnesota State Fair. ^ "J.V. Bailey House". Placeography.com. Retrieved 2008-08-29. ^ "Minnesota State Fair History" (PDF). Minnesota State Fair. Minnesota State Agricultural Society. Retrieved 14 May 2018. ^ "Minnesota Moment: Why we're called the Gopher State". Star Tribune. Star Tribune Media Company, LLC. February 16, 2018. Retrieved 14 May 2018. ^ Berdan, Kathy (August 25, 2016). "Q&A: Usually mute Fairchild is funnier – and punnier – than we thought". Twin Cities Pioneer Press. Digital First Media. Retrieved 14 May 2018. ^ Marling, Karal Ann (1990). Blue Ribbon: A Social and Pictorial History of the Minnesota State Fair. St. Paul, Minnesota: Minnesota Historical Society Press. p. 234. ISBN 978-0-87351-252-7. ^ "Attendance". 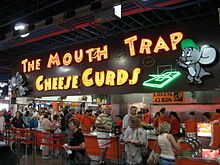 www.mnstatefair.org. Minnesota State Fair Attendance. Retrieved 2018-09-04. Wikimedia Commons has media related to Minnesota State Fair.